Blog | Can My Garage Door Opener Be Hacked? Can My Garage Door Opener Be Hacked? Now in the twenty first century, everything around us seems to be able to connect to the internet. 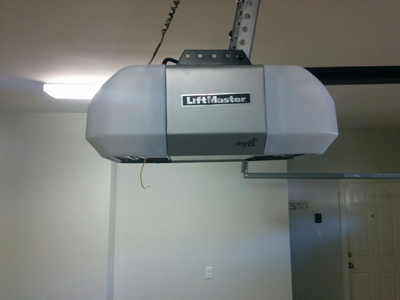 Many automated garage door owners have been finding ways to take advantage of these technological developments we all take for granted, with openers that respond to Bluetooth and the internet using mobile phones. But we’ve all seen enough movies where the world is at the mercy of the fingertips of dorky looking hackers, and so the fear is always there that providing connectivity to your entrances could be blowing a huge hole in your home’s security. So to answer the question of whether or not your opener can be hacked… yes. But it requires a certain amount of carelessness on your part to become a reality. Let’s start this discussion off with mobile technology, I’m talking phones and tablets. There are automatic opener receivers on the market that will allow your devices to connect with your home’s opener system either using Bluetooth or the net. Phones and tablets, themselves, are sometimes highly likely to be remotely hacked and controlled by an outside party if you do not take adequate precautions, such as using a virus protector on your device. If you’re going to be connecting everything in your home to the web, you should ensure that your home network is secure from outside attacks. Your internet routers are the point of most vulnerability, and if someone gets access to them, they can access everything that is connected to it, including your electric garage door. It’s worth your while to change your Wi-Fi password periodically, don’t give it out to anyone, and make sure it is complicated enough to not be guessed at. Swapping out those old opener remote controls for an efficient and convenient setup that can connect to your mobile devices over the web, is a great way of keeping up in an ever changing technological world. There are some simple precautions which need to be taken to ensure that they don’t cause any security issues for you and your home, however. Keep these few things in mind if you’re connected to the net. They are important. If maintaining computer and network security is beyond your understanding, then contact an IT specialist to secure your home network. You’ll not only be keeping your home safe from unwanted intruders, but you will also be bolstering the cyber-security of your household, which is essential in this day and age.